There’s nothing quite like a long hike to re-invigorate the senses and refresh the mind. However, the foot pain that can follow a long walk is less than ideal. Your feet spend all day working for you, helping you explore the beauty of the world: so, how can you repay them in the best possible way? While the right pair of walking shoes or boots can see you comfortably through your walk, recovery afterwards is just as vital for keeping your feet healthy and free from pain. Recovery time after any kind of exercise is important, and long distance walks are no different. The great thing about the human body is, with rest, it can repair itself. Taking the time to allow this is vital. A good night’s sleep is also a must here. As your body naturally produces growth hormone while you sleep, a full nights sleep allows plenty of time for you to rest and recover. We mean this literally! Walking and being on your feet for a long period of time can lead to swelling and pain in the foot; the best cure for this is elevating your feet. Elevating your feet to above heart level once you return from your walk will reverse the blood flow, reducing swelling and therefore easing pain in the feet. A foot massage will help to improve circulation in your feet, simultaneously easing foot pain and aiding recovery. And while professional massages can sometimes be costly (and not the most convenient option immediately following a hike), you can achieve much of the same effect yourself at home. Simply use a little massage oil, and feel for any tender points in your feet. Press gently on these points while flexing the rest of your foot to help circulate blood, ease your muscles and eliminate foot pain. Similarly, stretching your legs and feet after a long walk can make the world of difference. 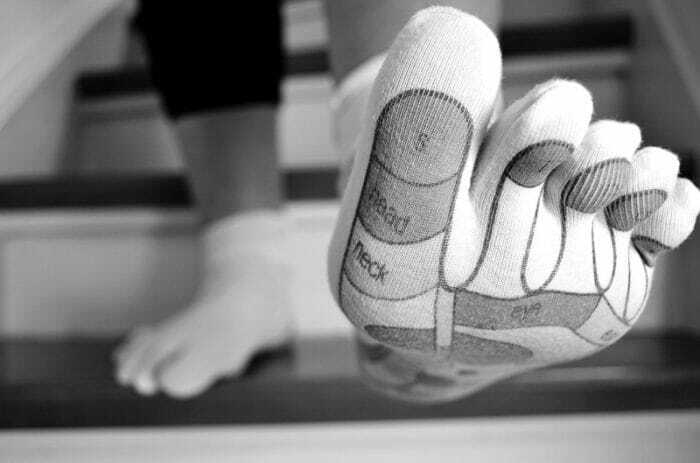 This can be as simple as rotating your foot in a circular motion, or gently stretching your toes back and forth when you get in from your walk. You could have the most comfortable walking shoes in the world, but they’ll never offer the mobility of being barefoot. Spend as much time as you can barefoot at home between walks to help keep your feet at flexible as possible. It is normal for the whole body to feel somewhat stiff after a long hike, so a hot, relaxing bath is a great way to soothe yourself and unwind. Throw in some Epsom salts to help relax your muscles even further. Finally, and most importantly, it is vital that you listen to your body and don’t overdo it. While a small amount of pain following any form of exercise is normal, if the pain is too much, stop. Always wait until your body is fully recovered before heading back out for another long hike. If you’re looking for further ways to keep your feet pain free, why not explore the footwear collections at Rieker? Whether you’re heading out for a walk or looking for a practical style for day-to-day, our selection of comfortable men’s boots and ladies boots ticks all the boxes. © 2018 Rieker. All Rights Reserved.